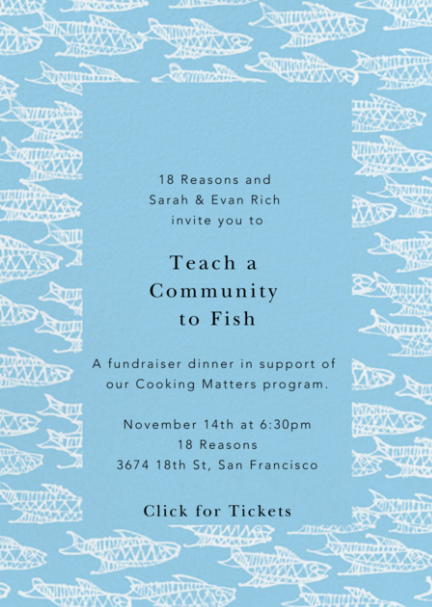 Join 18 Reasons and Chefs Sarah & Evan Rich for a very special dinner in support of our Cooking Matters program. Sarah and Evan will drop into the 18 Reasons kitchen for one night only to serve some of their favorite recipes. If you've ever eaten at Rich Table, or their new RT Rotisserie, you know that Sarah and Evan pride themselves on a relaxed, home-like atmosphere, paired with thoughtful, world-class food. This fall, they are releasing their first cookbook, which we will have on hand for this event. Our Teach a Community to Fish dinner series helps support our Cooking Matters program, which offers free cooking classes to over 3,000 low-income Bay Area families every year. The meal will be served by our staff and board of directors, giving us the chance to connect with our community. Your dinner will include wine pairings by Trac Le, Bi Rite Market's wine director. Sarah Rich began working in restaurants in college. Her first job was as a waitress and bartender in a fast-paced, wildly popular Mexican restaurant in Austin, Texas. Upon graduation she decided to realize a lifelong goal and packed up and moved to New York City to attend culinary school. Sarah studied at The French Culinary Institute (FCI) in Manhattan. At the FCI, Sarah received a strong culinary foundation working one-on-one with such culinary greats as chefs Jacques Pepin, Andre Soltner, and Allan Salliac. In her last months at the FCI, Sarah began an externship at David Bouleyʼs French- American restaurant Bouley, where she took a full-time position after graduating with honors. She worked closely with chef Bouley for the next three years at both Bouley and his Austrian restaurant, Danube. Under chef Bouleyʼs wing and with his mentorship, Sarah quickly rose through the ranks from extern, to commis, and eventually to Chef de Partie, further strengthening her culinary foundation. After leaving Bouley, Sarah helped to open the successful West Village restaurant Mas (farmhouse) with former Bouley Chef de Cuisine, Galen Zamarra. Sarah worked as the Executive Sous Chef at Mas (farmhouse) for the next three and a half years, further developing her butchering, sauce making, and menu development skills. As Executive Sous Chef, Sarah also took on a significant management role in the restaurant. Sarah was responsible for controlling the inventory and ordering, and for creating relationships with purveyors and farmers. She often ran dinner service, which involved writing the daily menu, directing and managing both the front of house and kitchen employees, and setting and maintaining high standards for their work. After eight years in NYC, Sarah was excited for a change. She and Evan took a trip to the Bay Area, where they were introduced to the incredible bounty available to them in San Francisco, and they made the decision to move west. Sarah immediately accepted a position as Chef de Partie at the two-Michelin-starred Michael Mina restaurant, and was quickly promoted to Sous Chef. She worked in the intense and demanding kitchen at Mina for the next two years, learning from and working closely with Chef Michael Mina himself and Chef de Cuisine Chris LʼHommedieu. After two years at Michael Mina, Sarah moved on to work at the two-Michelin-starred Coi with Chef Daniel Patterson. Here, Sarah learned an elevated style of cooking while developing a more sophisticated palate. Sarah eventually moved on from Coi in order to open her first restaurant, Rich Table, with her husband, Evan. Evanʼs first job in San Francisco was as Chef de Cuisine at the then one-Michelin-starred Quince. Evan worked closely with chef Michael Tusk, furthering his knowledge of pasta preparation and Italian cuisine. After leaving Quince, Evan took a position as Chef de Cuisine at the two-Michelin-starred Coi, where he worked closely with chef Daniel Patterson. At both Quince and Coi, Evan continued to develop his management skills, running both restaurant kitchens, designing menus, managing staff, setting and maintaining budgets and food cost expectations. Evan not only learned about products offered by local farmers, he also discovered what was available to him through his own foraging, and he developed and implemented foraging programs at both restaurants. Evan left Coi after three years in order to open his first restaurant, Rich Table, with wife Sarah Rich. Evan and Sarah live in San Francisco with their two sons.